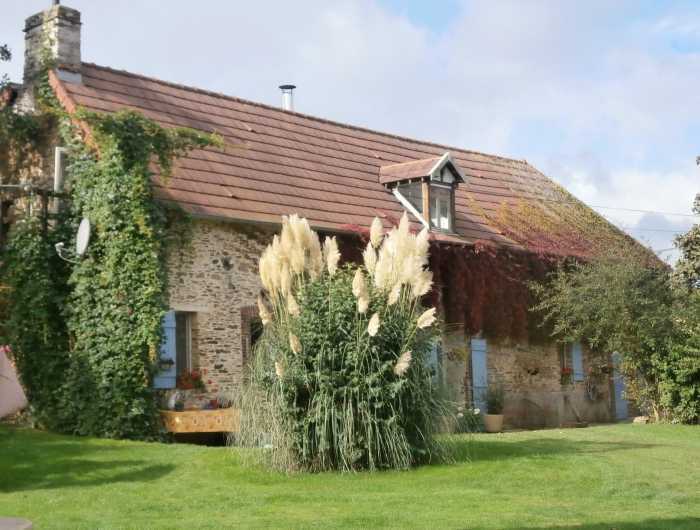 Litteau near to Balleroy…this house was renovated in 2004 and has been finished to a high standard It sits within its own grounds surrounded by a stone wall which used to belong to the Chateau of Litteau. Each gite has its own private garden space but the main house has a secret garden which provides you with your own privacy. Main House - Kitchen with fitted units and a wood burning stove leads in to a large living room with conservatory looking over the secret garden. An inner hallway leads to a family bathroom and master bedroom with a large walk in closet. The first floor of the main house has been converted into a private apartment consisting of a large Living room area with kitchen leading to a large bedroom. There is also a family bathroom. There is also a large attic space ideal for storage or conversion in to further living space. To the front of the main house there is a patio area and parking space which leads to a garden laid to lawn with a large selection of bushes, fruit trees and flower beds. There is a spacious south facing summer kitchen in the garden which is ideal for entertaining. This garden also has a cabin with two single beds ideal for extended family or guests. The first gite is located at the top of the garden and this comprises of a Living area with bed and a separate bedroom plus family bathroom. The second gite is located in the rear garden which has a pyramid poly tunnel and the garden is stocked with a large variety of vegetable and flower beds. The Gite has a lounge, kitchen, family bathroom and utility area.There is a patio area with superb views over the garden. Each garden can be seperated for pet friendly accommodation. The property is ideally located for all of Normandy's major tourist attractions including - Bayeux tapestry, D-Day beaches, Le Mont St.Michel etc etc.